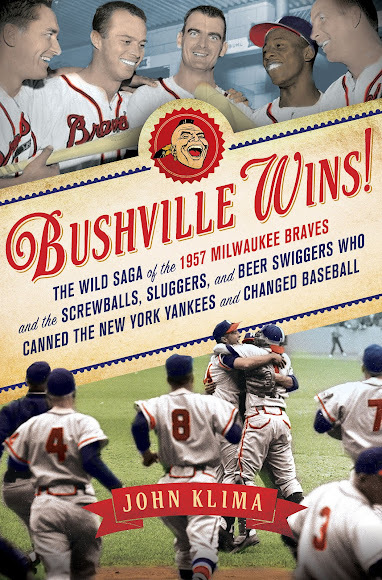 Borchert Field: Book Review - "Bushville Wins!" Today's Book Club discussion is Bushville Wins!. Subtitled "The Wild Saga of the 1957 Milwaukee Braves and the Screwballs, Sluggers, and Beer Swiggers Who Canned the New York Yankees and Changed Baseball", John Klima's book is a look at the Braves from their move to Milwaukee through the 1957 World Series. The book's title comes from a wonderfully-homemade cardboard sign carried by a group of fans in the downtown Milwaukee victory party, which was itself referencing an earlier jibe. Someone in the Yankees organization, possibly former Brewer skipper Casey Stengel himself, had reportedly referred to Milwaukee as "Bushville" upon arriving on the train from New York. The papers were all too happy to print it, playing into the David v. Goliath storyline they had for the Fall Classic. Cream City fans had the last laugh on the Perfessor, and the Milwaukee Journal's camera was there to record it. 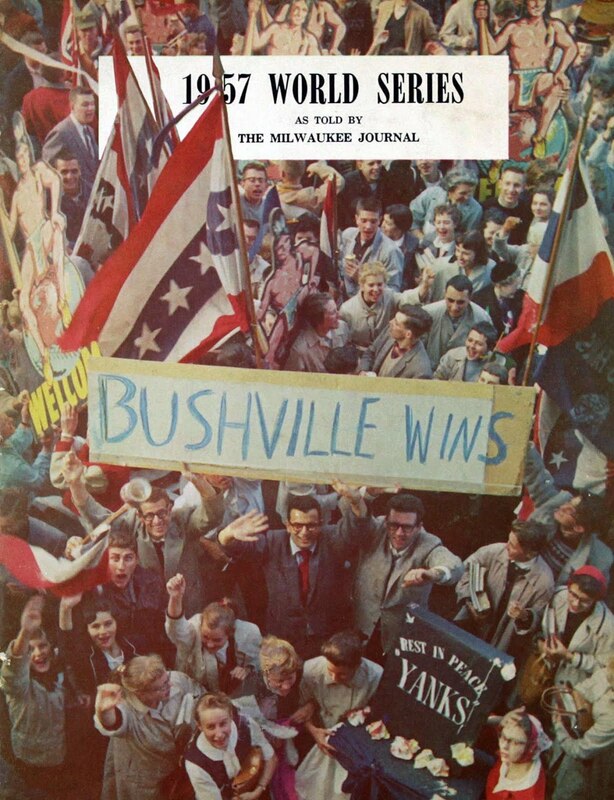 The resulting photograph was featured on the cover of its World Series retrospective supplement, and to this day ranks as one of the most iconic images from that Series. As you might expect, our Brews make a few cameo appearances. The first comes, naturally enough, at the beginning of the story as the Brewers' success lays the groundwork for a major-league move to Milwaukee. One of the previously-unsung heroes of that story gets full due in Klima's retelling; Fred Miller. Frederick C. Miller was the president of Miller Brewing, and the grandson of its founder. 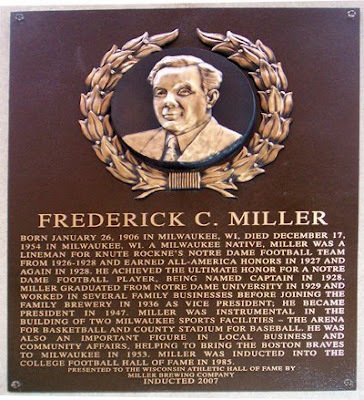 A lifelong sportsman who played football at Notre Dame under Knute Rockne, Miller was instrumental in bringing the Braves to Milwaukee. He was one of the driving forces behind the construction of Milwaukee County Stadium, and once that was underway he devoted himself to finding a major league team to occupy it. That determination is Klima's jumping-off point for the story. Miller's first preference was for the Boston Braves. 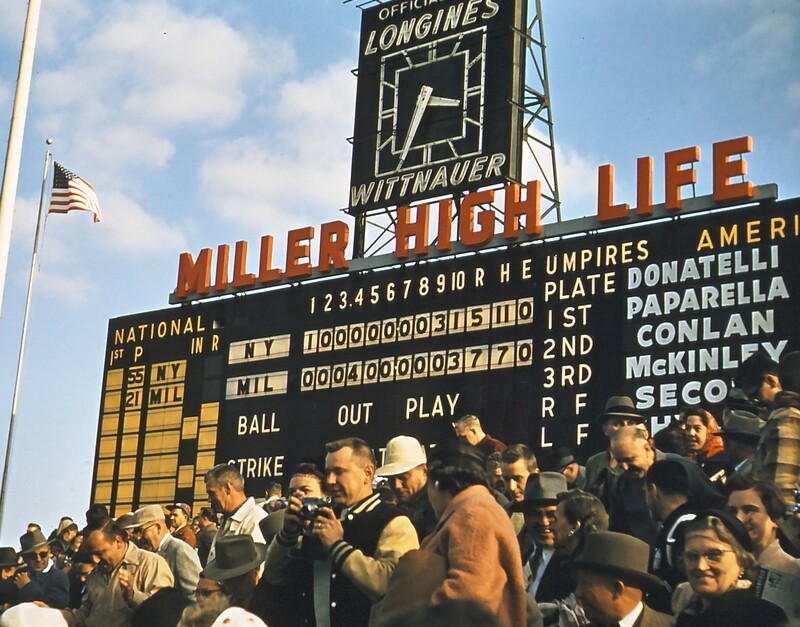 They had owned the Brewers since 1946, and were well aware of Milwaukee's potential. 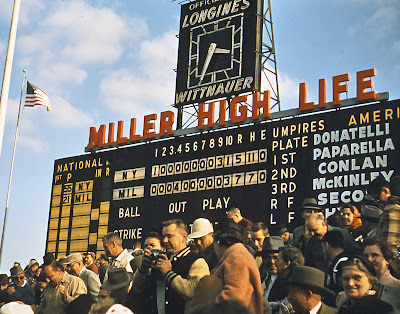 When Braves owner Lou Perini dragged his feet on a relocation, preferring to move no earlier than 1954, Miller forced his hand by turning to another man with a struggling team and love of the Cream City: former Brewers owner Bill Veeck. Veeck was desperate to move his Browns out of St. Louis, and knew that Milwaukee would fill all 36,000 seats of the new steel-and-concrete ballpark. Perini had no choice but to block Veeck's move, all but announcing his own intentions to the world (and Boston), so might as well get it over with and move as soon as the stadium was ready. The Braves were Milwaukee-bound, and the Brewers, victims of their own success, were bumped to Toledo. Miller died in a plane crash in 1954, before the Braves made Milwaukee a world champion, and so his contribution goes largely unsung today. Former Brewer manager Charlie Grimm, who took over the Braves during the 1952 season and moved with them to Milwaukee the following spring, would later say that had Miller not died in that crash, the Braves would never have left Milwaukee, and it's gratifying to see him well-remembered in the pages of this book. Miller's most famous product, High Life Beer, serves as a repeating motif throughout the book. The players grab on to the High Life in both senses of the word, as the hard-drinking men embraced, and were embraced by, their new hard-drinking city. On the surface, Grimm would have been the perfect man to lead this rag-tag crew. "Jolly Cholly" worked hard to earn his nickname, and was even known to drink with his boys. But as the Braves settled into their new home, Perini came to wonder if he could ever control his players, could teach them the discipline they would need. The Milwaukee fans, as glad as they were to be big-league, were starting to grow restless. 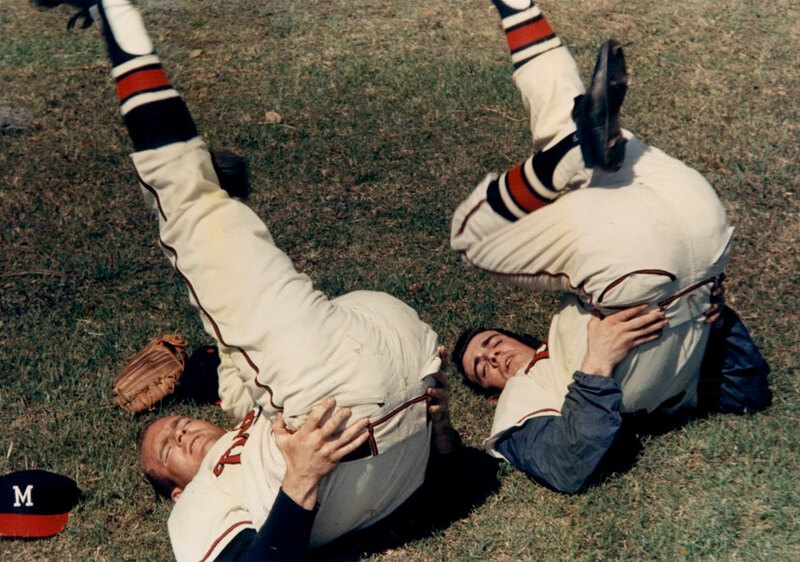 Klima quotes Warren Spahn as saying "We were in Milwaukee over three years before we heard our first boo." Perini was determined to give them something to cheer about. He brought Fred Haney over from the Pacific Coast League's Hollywood Stars to serve as third base coach (and watch over Grimm's shoulder). 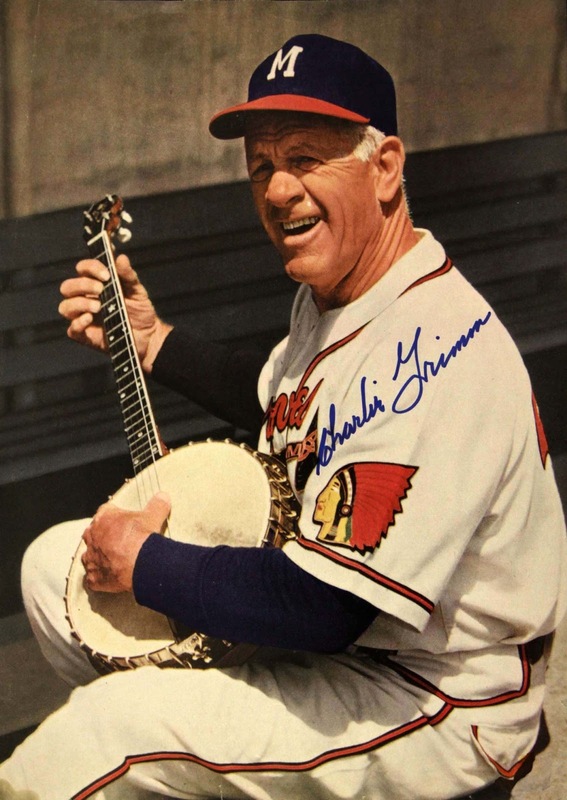 When the club sputtered out of the gate in 1956, Grimm was gone to be replaced with the actually-grim Haney. The most significant link between the Brewers and Braves was gone. Haney wasted no time in establishing himself as a taskmaster, and the Braves responded. They responded well enough to win 95 games and the National League pennant, eight games clear of the second-place St. Louis Cardinals. This is where Klima's story really kicks into high gear. 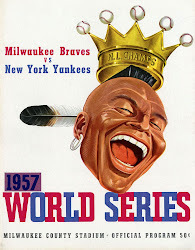 In the World Series, the Braves would face the New York Yankees, led by Casey Stengel. 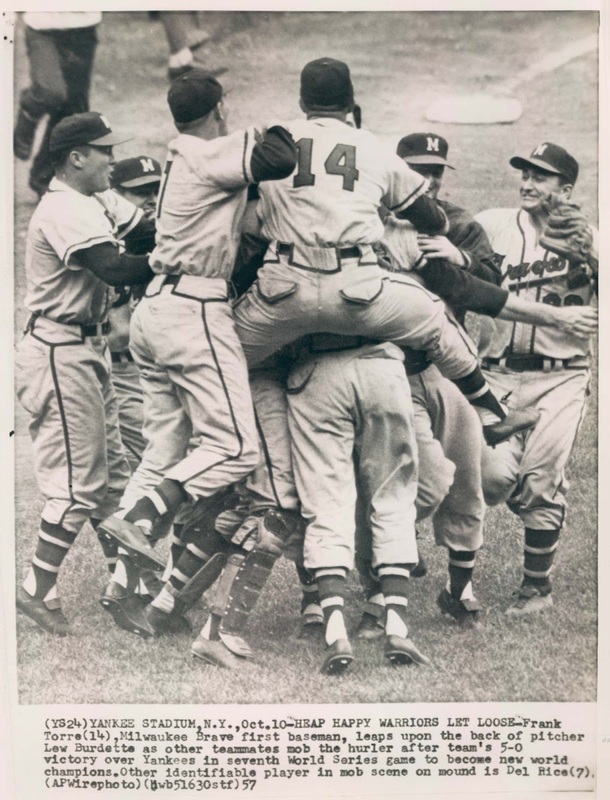 The Braves had broken up New York's stranglehold on the Fall Classic, which had been dominated by the Yankees, Dodgers and Giants since 1949, with one of the three taking home the world championship (often over one of the others). The interlopers from Milwaukee couldn't have seemed in that class, provoking the "Bushville" jibe. The Milwaukee fans gave him hell. When he brought in [a new pitcher] in the eighth [inning of Game 4], thousands of fans mocked him by counting his crooked steps to the mound. A fan in left field belted through a bullhorn, "Hey, bush leaguers! Hey, You bush league Yankees!" When Casey walked off the field, they counted louder. Casey had enough. He decided to respond to the fans. "I think Casey, as only Casey could do, lit the fire," Frank Torre said. When Casey reached the dugout, he blew the fans a kiss. That was part showmanship and part flipping Milwaukee the bird. The fans only jeered all the harder, especially when the Braves won the game in extra innings. The bad blood between Stengel and the Milwaukee fans extended to many of the Braves, particularly Spahn and Lew Burdette. The Perfessor had managed the Braves from 1938 through 1943 in Boston, during which time Spahn came up through the farm system. Stengel promptly sent him back down after four starts, when Spahn refused to throw at Pee Wee Reese in an exhibition game against the Brooklyn Dodgers. 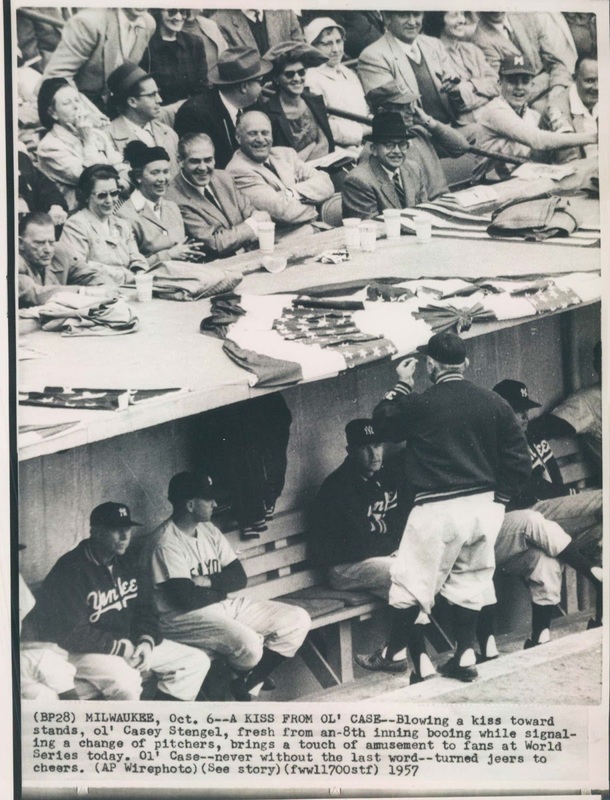 Stengel tarred Spahn as having "no guts" and sent him back to the minors. Burdette had been a Yankee briefly in 1950 before Stengel traded him to Boston. It must have been all the more satisfying when the Braves took the Series in seven games, celebrating on the Yankee Stadium mound. 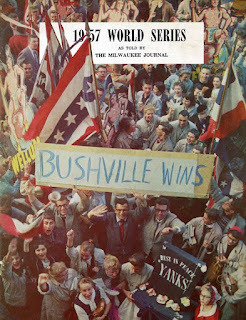 The victorious Braves were treated to a royal parade when they returned to Milwaukee. Fans lined the streets, including one mystery man who attended the festivities in a 1942 Brewer uniform, and some creative types brought a cardboard sign that lives on in baseball legend. Klima's book is engaging. His prose is florid, appropriate enough for a baseball tome, but occasionally becoming as gaudy as the awful color-tint job on the book's cover. He dips into the "High Life" metaphor one time too many for my taste. Sometimes it's hard to tell what is an error and what's creative license; the Yankees and Cardinals are both described as wearing black, appropriate for his story's twin villans if not terribly accurate. Slightly less attributable to style is his description of a Ryan Braun homer in September of 2011 that inspired a Bob Uecker radio call reminiscent of the Braves' Earl Gillespie. Any Brewer fan could tell you that particular game was to clinch the division, not the pennant. Sadly. Still, I don't want to diminish the joy of Klima's work. It's an extremely well-researched and entertaining book documenting an important chapter in Milwaukee's baseball history. I would urge you all to check it out today in either hardback or digital form.